The Imperial Legislative Council was a legislature for British India from 1861 to 1947. It succeeded the Council of the Governor-General of India, and was succeeded by the Constituent Assembly of India and after 1950, was succeeded by Parliament of India. During the rule of the East India Company, the council of the Governor-General of India had both executive and legislative responsibilities. The council had four members of the Council elected by the Court of Directors. The first three members were permitted to participate on all occasions, but the fourth member was only allowed to sit and vote when legislation was being debated. In 1858, the British Crown took over the administration from the East India Company. The council was transformed into the Imperial Legislative Council, and the Court of Directors of the Company, which had had the power to elect members of the Governor-General's Council, ceased to have this power. Instead, the one member who had a vote only on legislative questions came to be appointed by the Sovereign, and the other three members by the Secretary of State for India. The Regulating Act of 1773 limited the influence of the Governor-General of India and established the Council of Four, elected by the East India Company's Court of Directors. Pitt's India Act of 1784 reduced the membership to three, and also established the India Board. The Indian Councils Act 1861 made several changes to the Council's composition. The council was now called the Governor-General's Legislative Council or the Imperial Legislative Council. Three members were to be appointed by the Secretary of State for India, and two by the Sovereign. (The power to appoint all five members passed to the Crown in 1869.) The Governor-General was empowered to appoint an additional six to twelve members. The five individuals appointed by the Indian Secretary or Sovereign headed the executive departments, while those appointed by the Governor-General debated and voted on legislation. There were 45 Indians nominated as additional non-official members from 1862 to 1892. Out of these 25 were zamindars and seven were rulers of princely states. The others were lawyers, magistrates, journalists and merchants. The participation of the Indian members in the council meetings was negligible. The Indian Councils Act 1892 increased the number of legislative members with a minimum of ten and maximum of sixteen members. The Council now had 6 officials, 5 nominated non-officials, 4 nominated by the provincial legislative councils of Bengal Presidency, Bombay Presidency, Madras Presidency and North-Western Provinces and 1 nominated by the chamber of commerce in Calcutta. The members were allowed to ask questions in the Council but not allowed to ask supplementaries or discuss the answer. They were however empowered to discuss the annual financial statement under certain restrictions but could not vote on it. The Indian Councils Act 1909 increased the number of members of the Legislative Council to 60, of whom 27 were to be elected. For the first time, Indians were admitted to membership, and there were six Muslim representatives, the first time that such representation had been given to a religious group. Under the Government of India Act 1919, the Imperial Legislative Council was converted into a bicameral legislature with the Imperial Legislative Assembly (also known as the Central Legislative Assembly) as the lower house of a bicameral legislature and the Council of State as the upper house, reviewing legislation passed by the Assembly. The Governor-General nonetheless retained significant power over legislation. He could authorise the expenditure of money without the Legislature's consent for "ecclesiastical, political [and] defence" purposes, and for any purpose during "emergencies". He was permitted to veto, or even stop debate on, any bill. If he recommended the passage of a bill, but only one chamber co-operated, he could declare the bill passed over the objections of the other chamber. The Legislature had no authority over foreign affairs and defence. The President of the Council of State was appointed by the Governor-General; the Central Legislative Assembly elected its own President, apart from the first, but the election required the Governor-General's approval. Under the Indian Independence Act 1947, the Imperial Legislative Council and its houses were dissolved on 14 August 1947 and was replaced by the Constituent Assembly of India and the Constituent Assembly of Pakistan. ^ Banerjee, Anil Chandra (1984). English Law in India. p. 143. ^ Chandra, Bipan. India's Struggle for Independence. ^ Buckland, Charles. Dictionary of Indian Biography. ^ Bhattacharya, Sabyasachi. The Financial Foundations of the British Raj. p. 57. ^ Kashyap, Subhash. History of the Parliament of India. ^ India List and India Office List for 1905. Harrison and Sons, London. 1905. Retrieved 22 August 2013. 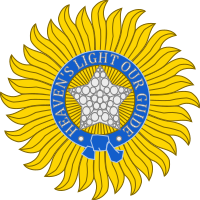 ^ "India- Governor General Council". UK Parliament. Retrieved 21 August 2013. ^ Government of India Financial Statement for 1894-95, Finance and Commerce Department. ^ Abdul, Latif Sayyid. Addresses Poems and Other Writings. The Government Central Press. ^ Mukherji, P. Indian constitutional documents, 1773-1915. ^ The India Office and Burma Office List. ^ a b c d Rao, C. Hayavando (1915). The Indian Biographical Dictionary. Madras : Pillar. p. 606. ^ Brown, Judith M. Gandhi's Rise to Power: Indian Politics 1915-1922. p. 162. ^ Bakshi, S. R. Punjab Through the Ages. p. 22. This page is based on the Wikipedia article Imperial Legislative Council; it is used under the Creative Commons Attribution-ShareAlike 3.0 Unported License (CC-BY-SA). You may redistribute it, verbatim or modified, providing that you comply with the terms of the CC-BY-SA.